Misconception #1: They’re all foreigners. Salafism is often—rightly—associated with Saudi Arabia. Indeed, it was this country’s immense oil wealth that enabled it to spread its ‘Wahhabi’ brand of Salafism abroad from the 1970s onward. But we should not deduce from this that Salafism in the West is essentially an ‘Eastern’ or ‘Gulf’ phenomenon. Groups that identify as Salafi in Britain are dominated not by Saudi migrants—whose numbers are actually very small—but by young people who were born here or who arrived at an early age. These include second- and third-generation Muslims—particularly South Asians—but above all, young Somalis and Afro-Caribbean converts. A growing number of young black people, typically with Christian backgrounds, have embraced Islam since the 1990s, with a significant number following the Salafi interpretation. This trend is most manifest in south London, where the Salafi mosque in Brixton (where I did much of my fieldwork) has offered a welcoming base for black converts—some of whom felt socially and culturally alienated at other mosques. Brixton became known as the ‘revert [i.e. convert] mosque’ and the ‘Jamaican mosque’ during the 1990s. Today, however, it is also host to a burgeoning young Somali contingent, who arrived in Britain after fleeing the Somali Civil War in the 1990s or were born in Britain following their parents’ resettlement. Salafism, for these British-born (or raised) Muslims, was convincingly ‘pure’ and ‘authentic’ because it appeared to be anchored in something familiar, authoritative, and readily accessible to them—the Islamic scriptures (Qur’an and Prophetic traditions). Many drew contrasts with what they described as a ‘cultural’ approach to Islam—i.e., traditions transplanted from their parents’ countries of origin. Misconception #2: They support Jihadism and shari’a for the West. While aspects of their purist creed are shared by Jihadi groups, most—probably the vast majority of—Salafis in Europe are explicitly against terrorism. Not only that, but they tend to oppose all formal political forms of organisation, such as political parties and campaign groups. Although they believe that the shari’a is the best system, they do not seek to impose it on non-Muslim countries. Instead, their (not uncontroversial) mission is peacefully to nurture distinct Muslim identities. This includes a duty to proselytize to both non-Muslims and Muslims who have, in their view, ‘deviated’ from the ‘correct’ path. In Britain, the ‘Salafi’ label has been associated with non-violent, often quietist groups since at least the end of the 1990s. These Salafis have condemned Al-Qa‘ida and ISIS vocally and vociferously on public platforms—occasionally at some risk to their personal safety and reputations. One preacher, for instance, encouraged his online followers to ‘mass distribute’ an anti-ISIS leaflet he had written, in which he urged anyone with information about terrorist plots to ‘inform the authorities’. That same preacher reported receiving death threats from ISIS sympathizers. Misconception #3: They secretly support Jihadism and shari’a while publicly claiming to respect the law of the land. During nearly two-and-a-half years of fieldwork with Salafi groups, I never witnessed any explicit or implicit support for Jihadism, or calls for shari’a for the United Kingdom. I only ever witnessed condemnation of the former, and express prescriptions to obey the law of the land. While it is, of course, possible that Salafis moderate their speech in front of researchers, it would become almost impossible to keep this up after a few months of regular interaction. That’s why long-term participant research is so valuable. Once I became a familiar face in Salafi circles, I became less conspicuous and people were less likely to react to my presence. In fact, a few women felt comfortable enough to tell me about their prior sympathy with or involvement in Jihadi groups, such as Al-Muhajiroun, and why they had left these. Other Salafis had actually helped them to understand that terrorism was forbidden by the scriptures. Misconception #4: They are brainwashed. ‘Brainwashing’ is typically understood as a coercive process that renders an individual powerless to choose an alternative course of action. Although five decades of research on New Religious Movements have yielded no empirical evidence for the so-called ‘brainwashing thesis’, it is nonetheless often regarded as the primary reason why people become ‘Islamic extremists’. I found no evidence of so-called brainwashing. On the contrary, I found that the Salafi conversion process was largely intellectual, rather than based on social or other pressures. Each woman’s story was unique, but all spoke of coming to see Salafism as an approach that made rational sense to them. Typically, I was told that Salafism was an evidence-based methodology, with every single prescription tied to ‘authentic’ scriptural ‘proofs’, rather than to culture or human opinion. This gave the women—most of whom had been exposed to a plethora of Islamic interpretations—the reassuring certainty that they were following the ‘pure’ Islam. Far from being caused by social pressures, conversion often occurred despite protests from family and friends, and frequently led to long-term rifts in families and friendship groups. It also had little to do with warm feelings toward other Salafis. On the contrary, under the condition of anonymity, many interviewees spoke of the Salafi ‘sisterhood’ as cold, unwelcoming, and judgmental. Others said that their conversion was smoothed by the experience of a strong and supportive community—but this was often only during the holy month of Ramadan. Misconception #5: They are the uneducated ‘drop-outs’ of society. Some argue that, while Salafis are not brainwashed, they are the downtrodden, alienated ‘drop-outs’ of society, whose lack of education makes them ill-equipped to make sensible, rational decisions about their lives. My impression as a researcher was that these women are at least as likely as the general UK population to pursue higher education. Most of my interviewees had already started or finished university, and just one had no plans for further education. Most were also keen to launch or pursue existing careers. Misconception #6: Salafi women are forced to wear niqabs (face veils). Coerced veiling undoubtedly occurs in many societies, but I could not find a single case among the Salafi women I interviewed in Britain. I did, however, encounter many cases where women’s families tried to force them—sometimes threatening violence—to discard their veils and gowns, which they saw as ‘extremist’ or ‘the culture of the Arabs’. A few young women confessed to having actually concealed their niqab-wearing from relatives, wearing the veil only when at a safe distance from the family home. Anabel Inge completed her PhD at the Department of Theology and Religious Studies, King's College London, where she won the Arts and Humanities Research Council (AHRC) Doctoral Award and Walton Scholarship. She has taught courses on Islam and the Anthropology of Religion at SOAS (University of London) and King's College London. 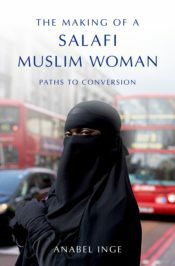 She is the author of The Making of a Salafi Muslim Woman: Paths to Conversion (OUP, 2016). Salafism is a cault nad not part of Islam. Salafism totally anti Islam and should be knowna as extrem ideology which hS noting to with Islam , this cault ideology followed by Saudis, Isis, Taliban and all the extrem terrorist groups. Hi. I would like to suggest another book for you to research. A lot of Non Muslims view Muslim women as oppressed and abused. I think that many (cultural) Muslim women are abused. In contrast to Salafi women who are married to Salafi husbands who understand the religion properly and who treat them with the utmost kindness and compassion. It would be great to see the non Muslim world learn what Islam really teaches about the treatment of wives from the authentic sources. The Quran and authentic teachings of the Prophet Muhammad (peace be upon him), his companions and first three generation of Muslims. The most important field to research when researching Salafi Islam is the study of Tawheed (monotheism) from a Salafi point if view.This field gives extensive knowledge of our Creator Allah, in a way that is spiritually enlightening, based on proofs. either textual proofs from the Quran and Sunnah or universal proofs that can be found all around in the universe in all the different things that Allah has created. Studying the Names and Attributes of Allah (the Most High) gives so many details about God, details that can not be found anywhere else. Beautiful details that compell the soul searcher to submit willingly to the laws of Allah. When a person reflects sincerely on these Beautiful details and descriptions of Allah they will come to the conclusion that Allah is the Most Just, The Most Kind, The Most Compassionate and The Owner of Peace. Such that there can not be any injustice in His Laws, and such that these laws were only revealed.for our Benefitand such that there can not be any true happiness in this life and the next except through willing submission to Allah. The research is so true n updated.I feel much happy after reading it.well done for highlighting the truth in today’s dark world. As a revert to Islam myself I want to warn other reverts and genuine Muslims in general of what I believe may be an organised system of deviant individuals and groups impersonating Sunni Muslims including Salafiyyah and may appear to be highly convincing by using extreme taqqiya and may be supported by other groups and organisations in a deceptive charade to deceive Muslims with malicious and criminal intentions- I advise you only for the sake of Allah to be extremely careful and cautious in your dealings with people, even those who may appear to be from ahl us Sunnah and calling to and inviting to Islam. I believe this may be a major issue here in the UK and by logical extension may be happening in other places also. From my own experiences and from reports I have seen in the media I believe these people may be trying to entrap individual Muslims in criminality or in other ways through marriage, blackmail, threats etc. with one objective being making Muslims leave Islam and for other (religious/political) reasons these people may have and to counter the increasing numbers of people reverting to the religion-please be EXTRA careful in your friendships and relationships and particularly as regards marriage. This is not written to incite fitnah/mistrust amongst people but to warn others and make them aware because of what I have experienced and continue to experience as a revert here in UK-from individuals and groups who ascribe to Sunni Islam and from other groups and organisations in the wider community- in what I believe were attempts to entrap me in criminality and through other methods and oppress me into obeying these people who I believe to have evil intentions towards Islam and Muslims. of all the islamic interpretations that i have met in my life, the salafi methodology respects academic integrity the most. they don’t just blindly follow without evidence unlike sufism and other culture-infested islamic interpretation where you can be scolded for asking/challenge evidence.